You can have all of your photos and movies managed by one database, yet still use the necessary tools to get the job done. Many of my current assignments require that I deliver both video and images. A workflow that will keep you from going crazy it to upload everything into Aperture 3. For simple video pieces, you can edit video in Aperture. If you need more tools, then iMovie '11 can tap into your Aperture library for content, create and output movies, without duplicating the source material. This gives you one set of master footage, but multiple production options. iMovie '11 using Aperture 3 to manage assets. Click on image for larger version. Organize as you normally would. Launch iMovie and let it generate thumbnails for all of your Aperture video. This could take a while if you have a lot of content. 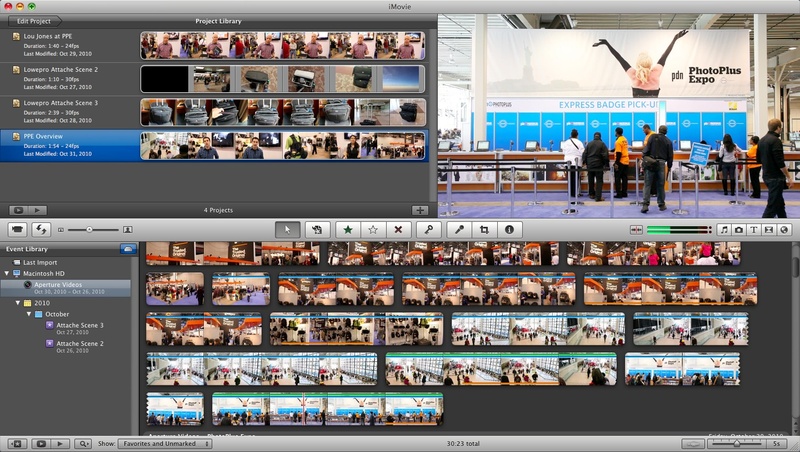 Edit and produce your video in iMovie. The source material in Aperture will be read, but not altered. iMovie will create a couple megabytes of material and store it in the "iMovie Projects" folder. But that's about it. And even if you need to move your Aperture library to another hard drive, you can reconnect the content in iMovie (iMovie Help explains how). It a fairly efficient approach that will help you manage all of your source material. You can also use iPhoto instead of Aperture in this scenario. If you want to see an example of the Aperture/iMovie connection, here's a video that I produced on assignment for Lowepro at PhotoPlus Expo 2010. I shot the footage with a Canon 5D Mark II, uploaded to Aperture, edited in iMovie, and produced before I returned home. You can work very fast using this set-up. This is a workflow I've been trying to implement. The trouble is that when you store movies in Aperture by reference, they don't show up in the iMovie events list. Only movies that are inside the Aperture library. Are you not seeing this limitation? If not, how did you get around it? That's the first question that popped into my head - all my photos and videos are referenced. Who can really keep their images/videos on a local drive?! I'll start with Angelo. You don't have to keep your content on a local drive. Your Aperture library can live on any external drive. And even if you start out with a project on a local drive while on location, you can move it when you get home. As for Thomas, I do see that. If you use iMovie keywording, favorites, group events by month, group events by disk, etc., you can organize the Aperture content fairly well within iMovie. I'm not a huge fan of keywording in Aperture, but in iMovie I find it very useful. Take a look at this in the Help section and see what you think. I'm a little confused as to how keywording would help get the Aperture referenced movies to show up in iMovie. Are you saying it's possible to see them if the correct procedure is followed using keywords or are you just saying that keywording helps once they are available in iMovie? I've been working with @ApertureExpert on this same topic. I started a topic on the ApertureExpert.com forums. Joseph wasn't aware of this limitation when I asked but said he'd look into it. I'm talking about keywording in iMovie to help you find the referenced clips you have under Events>Aperture. This Apple support article describes what I'm talking about. I guess it's by design or a bug they haven't fixed yet. Hi Thomas, Oh, I see what you're saying. Thanks for sending me the support article. That is definitely a bug because in iPhoto Help it refers to being able to move movies from the Event library to an external hard disk. I will do some more testing to see how all of this shakes out. Thanks again for clarifying so that I (finally) understand. Just to clarify, Thomas, if the movies live in the Aperture library, they show up for you in iMovie events. And even if the Aperture library lives on an external drive, this still works. Where it broke down for you, is if your movies are referenced, regardless of where the Aperture Library lives, then they do not show up in iMovie Events. Correct? If so, I will see if there is a workaround for this. Your last post is exactly right. This problem existed in iLife 09 as well. With iMovie '09 there were two cases where Aperture videos didn't show in iMovie. One was when they were shot in 24p (because iMovie couldn't handle those) and the other was when they were outside the Aperture Library package (referenced). With iMovie '11, it now handles 24p and some of my movies now show that didn't show before. But the referenced movies still don't show. I do keep my Aperture library on a non-boot drive but it is still internal to my Mac Pro. Even when I used to have it on the boot drive, referenced movies didn't appear in iMovie. I'm surprised you haven't seen this before as I recall you stating at some point (podcast or webpost) that you keep a referenced Aperture library. Thanks for your patience with me Thomas. I do keep a referenced Aperture library, but it's on my main computer in the studio. When I work in the field, I used a managed Aperture library, then export it when I get home, and merge it with the main library. At that time I separate the masters on to their referenced drive. I sometimes keep entire managed Aperture libraries on separate drives too. I do the bulk of my movie editing in the field for quick posting during the events I cover. That's why I didn't run into this particular bug. But I would like to find a workaround for it while we wait for the fix. This workflow has so much good potential. I've been doing this for a while, but since the new iMovie and AP3.1, iMovie has been hanging when trying to build Aperture thumbnails, and hasn't made any progress in hours. I think I've seen reference files show up, but haven't tried to work with them. I'll do some testing once I get iMovie to work. Thanks Michael. Any help would be appreciated. I did some more experimenting with this today. Another problem that I hadn't anticipated was trying to reconnect everything when I moved the temporary Aperture library off my MacBook Air on to my main Mac. Even though I also carefully moved the iMovie Events and Projects folders, they remember the source movies via hard file paths, and there's no way to adjust that or reconnect the files. So you would have to use the exact names and file paths on your portable computer to move all of your work in tact to the big machine at home. I had misread the iMovie Help about this (my bad for sure), and I was under the impression that I could reconnect source material after a move. I'll keep testing, but this is indeed a setback. What if you create a "Project as New Library" incorporating footage while on the road and simply re-import changed footage when returning Home? Does iMovie'11 see the update? When I edit a photo in my Aperture library - a photo that is included in an iMovie project - are my edits reflected in the iMovie project, or do I have to delete and re-add the photo? I'm using Aperture 3.1 and iMovie11. I've had some strange things happen which make it seem like iMovie photos are NOT updating when edited in Aperture. I'd like to know if this is by design, or if there is a problem with Aperture 3.1 and iMovie11. Appreciate any input on this! Thanks. There is an issue with the new version of iMovie and Aperture 3. I have reported this to Apple and they have confirmed. Pictures that were imported through Aperture 3 will only show the Master photos in iMovie. THe edits show as the thumbnails, through the Camera browser icon but its only the Master image that ends up in the project. Photo's that were originally imported in Aperture 2 and then upgraded to Aperture 3 are OK and show the photo's with edits in the masters. Anyway, I have somewhat of a workaround. If you have QuickTime Pro, you can save video files as references. This will create a very small dummy file that points to the original. You can import this file into iMovie. It will copy the dummy file into it's event library, leaving the original in tact. To make this process somewhat easier, I wrote a short Apple Script which I leave on my doc. When I drag and drop movies to it, reference files of the originals will automatically be created. I then import these into iMovie. I could probably make the script automatically import into iMovie too. I just haven't gotten around to that yet. Here is the script for those who are interested. set newFilename to filePrefix & " ref.mov"
-- Open QuickTime, open the current file, and save it out as a reference. I can't get my iMOVIE '09 to open up because while it automatically begins Updating Aperture Video Events the iMovie application quits unexpectedly. Any ideas or disconnects I can do to allow the iMOVIE application to load up again and avoid APERTURE 3.1?